Last week I got more of the specialty stitches done on this. It's easier to do them than it is all the cross stitches. I really need to get more time to stitch. Not going to happen today - ten hours in a car. Doing the driving. Well, Cathy sent this block out without a specific theme outside of it being made completely of old ties. The previous person added the patriotic cigar silk, and I picked that up for my work. This top picture is of the block after I worked on it. This is the seam I did. The seams otherwise were heavily beaded, so I decided to balance it out some. And here is the star I stitched for it. I think it came out pretty well. As seen in this picture, I'm redoing the right side border. It's coming along. I've gotten another square done and this section has a corner, so I can see how that's going to come along. It's interesting. Since I've finished two deadline pieces this week, I'll be working on catching this up more, too. I got one of the bands done this week and started the bottom stars. Now to actually get more done. I'm feeling soooo behind still after the nearly month-long break. I think I'm finally making a dent in the items with deadlines, though, which is a good thing. Happy Thanksgiving to all of you. I'm grateful for having the time, ability, and stash to stitch whenever I can. I started this one day and finished it the next. It was the October program at my face to face EGA chapter. the fluffy stitch is called rya, and it looks like it could be successfully substituted for turkeywork in some situations (ie, when you need directional pile. I think it came out kind of cute. It also counts as number 13 on my project challenge and my July ornament for my ornament a month. A quickie threefer! It's a Van Dyke. At least, that's what Jim Wurth calls the stitch I used to fill in the two horizontal bars. I really need to catch up on my stitching and get things done. This project would be so quick and simple if I did them one at a time. Maybe my resolution for next year will be to cut down on the multi-tasking. This last session I stitched on this, I added some details to this first house. I still like how it's coming along. I had fun working on my kiku temari this week, and got two motifs done. Only three more to go and it'll be done. I'll probably do those over this coming week. I really like making temari and have ordered some rice hulls so I can make some more. Okay, so with my hospital visit and so on, I didn't get as much done as I'd hoped on my stitch commitments to others. I finally finished one of my round robin commitments this week. Cobi chose the theme of India, and India is orange to her, so the block is orange. 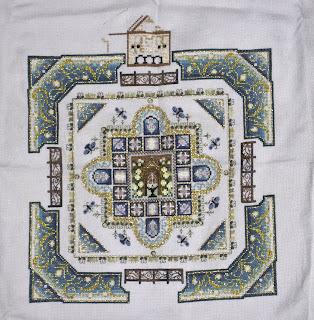 I did two motifs and one large bead line. They're visible in this close up. The circular motif is supposed to be a mandala circle, or prayer maze. The one up top is a basic shaped I found from a picture of a street drawing in Delhi. I punched it up with a lot of "bling" metallics. 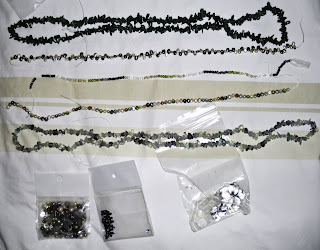 The bead trail is supposed to symbolize how India juxtaposes so many divergent things but they all come out as a harmonious (for the most part) whole. I haven't been posting this week because I had no pictures! Now I do, my husband took a lot today. This one is of my finished alphabet for the old French round robin. It should be framed really soon, as my husband has the frame made already. He was waiting for me. This counts as a finish in my twenty-five project challenge. Between this and the crackers, I've now finished eleven things! I found this freebie ornament on Solo Brode a couple of weeks ago and decided to make it. I'm using Bush Christmas from Dinky Dyes and a leftover piece of linen. I think it's coming out cute so far. While I was on holiday, I managed to get to T on this. I haven't worked on it since, though it's in my modified Christmas blitz rotation. Truly, I should just take a day and finish it. Only six more letters, after all. I finished these up this morning, and since my husband took a picture of them, they're all sealed into their envelopes and ready to go places. Each one has threads and trims and buttons and beads inside. I hope the recipients like them. Yesterday, I got this beautiful Christmas cracker in the mail. It's the same exchange that yesterday's blocks were made for. I wonder what's inside. One of my quilting groups is having a Christmas cracker exchange. We make crazy quilt blocks to embellish and then roll them up into crackers stuffed with stitch goodies. These are the blocks I made for the exchange - all of it done this week. I got something done! It feels good to have something completed after such a long drought. Now this goes off to my husband to frame or whatever for one of his colleagues. I like the way it turned out, and it counts toward my project challenge, since it was stitched totally from stash. With all that's gone on this past month, I feel like I've made so little progress with everything. 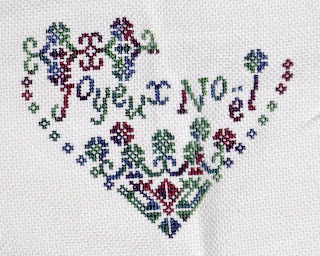 That's why I decided to go ahead and finish Joyeux Noel. It'll make me feel better to get something -done-. The bottom left corner has all its Rhodes in place on this neglected mandala, and the bottom right is started. At least it's something new. One project I managed to work some on in the past couple of weeks is this little ornament. I still love the colors on it. They look brighter in person than in this picture. I think I'm just going to finish it before stitching on something else, and ease myself back into stitching. 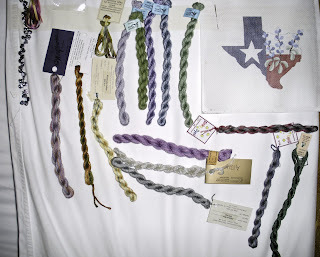 I bought lots of stuff at The Needle Works in 26 Doors in Austin during my holiday. The threads patterns, and canvas are all from them. They have Gumnuts, the whole line, and I love the feel of that stuff. I bought several other threads too, and a canvas to help me remember home where ever I am. 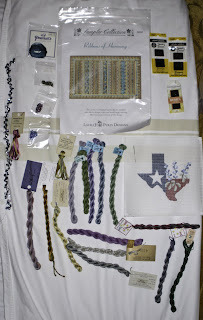 The beads were all bought in Rice Village in Houston, almost next door to where I got the ribbons in my earlier stash post. 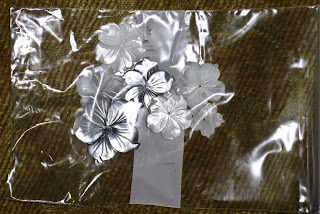 Aren't these mother of pearl flowers great? They had them in sizes from about an inch across to nearly four inches. 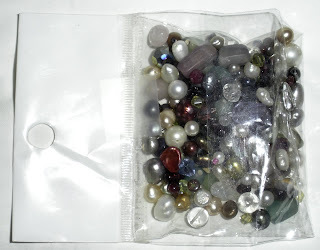 And I got lots of strings of beads too. They were relatively inexpensive and oh so beautiful! Now I have to make more things to embellish. only six dollars, and it's -heavy-. 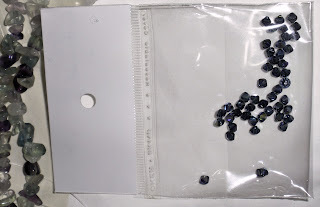 And the crystals below are dark blue with an AB finish. The picture doesn't do them any justice whatsoever. Okay, so my surgery knocked me for more of a loop than I thought and I should have pre-written some posts. I'm much much better now and ready to start stitching again! This picture was taken before the stitching and is of Poirot. I got some of the ribbon outlines done on it before I put it aside for the holiday and surgery. I'll have Texas Ren Faire and Ellington Field pictures up in the next few posts, so you now know where I went. It was a great way to avoid the anxiety pre-op buildup. I like how this is coming along and hope to finish it before Christmas (yes, I can hear you laughing now).